Looking for a way to get rid of that nasty stain? These 7 homemade carpet stain removers are easy to make and very effective. Are you part of the do-it-yourself cleaning products revolution that’s sweeping the country? If not, it may be time to get on board. This increasingly popular trend of using homemade cleaners is catching on like wildfire for many different reasons. Some homeowners want to avoid the abundance of chemicals found in many commercial cleaning products, which may be harmful to people and to the environment. Other homeowners are looking for ways to cut costs. Cleaning alternatives that use common household items can be equally effective yet significantly less expensive than their commercial counterparts. Using homemade cleaning solutions also lessens the need for specialty cleaning products, saving shoppers cabinet space and the time it takes to hunt for those items. • When someone spills juice or red wine on your carpet, try using club soda as an easy, inexpensive stain fighter. Club soda works best on fresh stains, so be sure to act fast. • Whether your carpet is made of synthetic material or natural fibers, this stain solution can clean it. It uses common household ingredients like dish washing detergent and vinegar. • For those times when you need a little more stain fighting power, add baking soda to dish washing liquid, white vinegar, and warm water. Mix the ingredients in a spray bottle and you’re ready to go. • Or, try this combination of white vinegar, salt, and lavender scented essential oil to clean stains and deodorize. • If your pet is your carpet’s worst enemy, here are three natural remedies to try, so you can remove pet stains and their accompanying odors. • To tackle every type of carpet emergency, always have these key ingredients on hand: lemon juice, baking soda, vinegar, and natural soap or organic detergent. 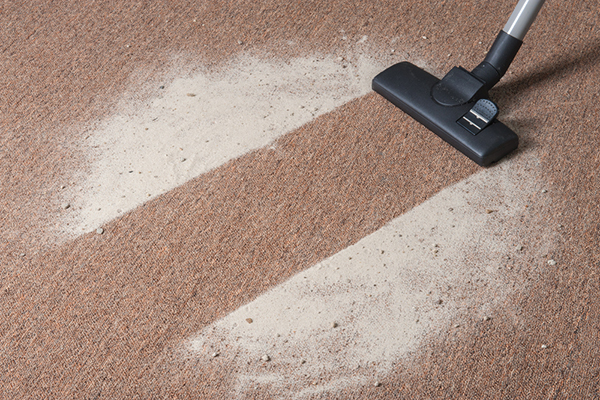 These compounds, whether they’re working together or alone, are sure to clean almost any carpet. Before trying any of these homemade carpet stain removers, be sure to test a small amount of the solution on your carpet in an inconspicuous place, such as in a corner or under a large piece of furniture, to check for color fading or other damage. For the best results, always treat stains right away. Letting some stains sit for even a few minutes can make them difficult to eliminate. Blot up as much of the stain as you can with a clean, dry towel or cloth before applying any solution. It’s usually best to spray the solution on a clean towel or cloth, and then apply it to the carpet. Always use a blotting motion and never rub carpet vigorously. Rubbing may only serve to work the stain further into the carpet and can also damage the fibers, altering the carpet’s appearance. When working on a stain, it’s usually best to start from the outside perimeter, and move in toward the middle to prevent spreading the stain and making it larger. After the stain is removed, lightly blot up any excess moisture left behind by the solution. To avoid carpet spills and stains in the first place, try to limit all eating and drinking to one or two rooms in your home. Place area rugs or plastic under tables and chairs. Position mats at all entrances and exit doorways, and encourage people to wipe their feet or remove their shoes before coming inside. Keep art supplies and markers in closed containers and supervise children when they are being used. Be diligent in house training pets, and keep their paws clean. Confine makeup and beauty products to bathrooms or to other non-carpeted areas, especially nail polish. With a few preventive measures and some homemade carpet stain cleaners in your arsenal, you can keep your carpet as good as new with minimal effort. But remember, if you encounter a stubborn stain that you can’t remove, it may be time to call a carpet cleaning professional for assistance.